He now has a chance to make a strong case for a comeback and make his way into the Indian squad for the upcoming ICC World Cup 2019. KL Rahul had a miserable 2018 when it came to incidents on and off the field. He found out new and improvised ways to get out on the field and courted controversy with his appearance of a chat show hosted by Bollywood director Karan Johar. Despite everything, the team management has shown faith in him and he made a return against Australia recently. 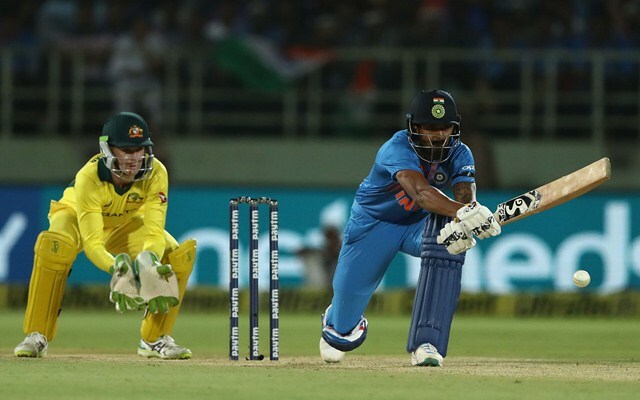 KL Rahul played in the two T20I series against Australia and had scores of 50 and 47 in those matches, giving him hopes of making it into the Indian squad for the upcoming ICC World Cup 2019. He will also have a chance to prove his mettle in the 50-over format, as he has been included in the Indian squad for the five-match ODI series against Australia as well. KL Rahul had played just three ODIs in 2018 and scored a duck in one of them. It was only after he returned from suspension and joined India A side and played a couple of good knocks, scoring 80 odd runs against England Lions, that he came back into contention for the Indian team. Virat Kohli watched him play two good knocks for India in the T20Is and spoke on his chances for the World Cup 2019. “It augurs really well. KL, when he plays well, is operating at a different level I feel. We have seen him do that in the IPL last year and in patches over the last season we played as a team,” the skipper said. Kohli praised the consistency of KL Rahul and called him a special player who can play good cricketing shots and still win you games at a strike-rate of over 140 or 150. Kohli reminded everyone that Rahul had a good technique and all the shots in the world with the ability to dazzle everyone with his stroke play. Kohli mentioned that Rahul had made a strong case for himself for the Indian squad for the World Cup 2019 and is in a good nick. Kohli hoped that Rahul carries the form forward and make it into the final squad of the World Cup. KL Rahul had a torrid time in England in the Test matches, despite scoring a century in one of the T20I matches and helping India win the match. Rahul was unable to cope with the swing and seam movement produced by the England bowlers and could only manage a century in the final Test of the series when India had already lost the series. He ended up with 299 runs in 10 Test innings against England. The story continued in Australia as well, where KL Rahul was found out by the Australian bowlers and failed to do anything substantial in the three Tests he played, making only 57 runs. Then he made that ill-fated appearance on Koffee with Karan chat show alongside Hardik Pandya, which snowballed into a huge controversy and he was too suspended until further notice.